Essendon will dedicate its round 17 clash against North Melbourne to charity partner Challenge. Positions on this season’s unique 2019 Challenge Guernsey continue to fill up quickly as donations to Challenge from the promotion tick over $20,000. 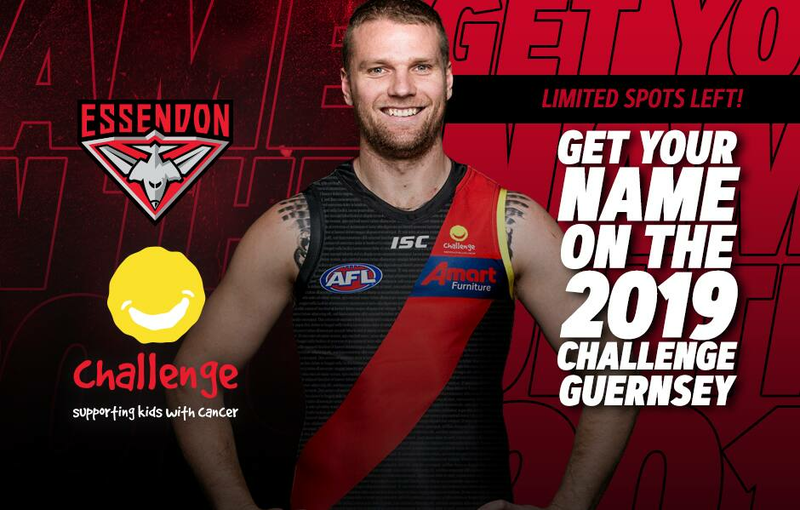 Essendon recently announced that 150 extra fans could have their name* added to the guernsey, which will be worn in round 17’s Tackling Childhood Cancer Game against North Melbourne. All proceeds from the sales have been directed to the club charity partner, which provides crucial support for children and families living with cancer. Generous fans who purchase a name will also receive a souvenir guernsey boxed and delivered, an invitation to an event at Challenge where you can meet EFC players alongside the many beneficiaries of the organisation, as well as the opportunity to purchase your favourite player’s match-worn guernsey. But if you would like to be a special part of Bombers history and see the Dons carry your name on the field, you will need to act quickly, because the few remaining spots are rapidly running out. So don’t miss out and please help contribute to a great cause. *Names to appear on the guernsey will be limited to 17 characters, including spaces.